Is It Worth The Money? Honda Civic Vs. Honda Civic Hybrid. The Honda Civic that is the most likely match for the hybrid version is the Civic EX, which starts at $19,510 with an automatic transmission. The car pretty much comes loaded with everything under the sun except for navigation and leather seats…which is good, because the Hybrid we compare it to won’t either. The car has a 140 HP 4 cylinder engine, a full array of airbags, and claims to get 30 mpg city/40 mpg highway. Not bad at all! It holds 13.2 gallons of gas, so at 40 MPG on the highway you can go 528 miles. Rated as an ULEV (ultra low emissions vehicle) it is probably one of the better “green” cars on the road that is not a hybrid…it emits 6.30 tons per year of greenhouse gases, putting it towards the lower end of every car on the road. So to make a difficult comparison a little bit easier (so I don’t have to go get an engineering degree) lets do some simple math…$19,510 for the car plus $595 destination fee plus $1,659 in tax (here in California) makes the Honda Civic with a gas engine cost $21,764 just to drive it home. And let’s say you keep it for 5 years and you drive an average of 15,000 miles per year at 35 MPG, which amounts to 2,142 gallons of gas at today’s price of $3.00, so your total for gas would be $6,426. Total expenditures: $28,190 over 5 years. Then if you sold the car, Hondas normally retain 49% of their retail value over 5 years, so it would still be worth $9,959. $28,190 – $9,959 = $18,231 for use and gasoline of the car over 5 years, or $3,646 per year to own and drive the car. Pretty decent figure, I must say. So what about the Honda Civic Hybrid? Do you think it can beat that? 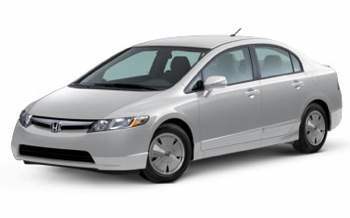 The Civic Hybrid starts at $22,600 with an automatic transmission and has the same options as the standard car above. It has a 110 HP engine, safety features everywhere, and claims to get 49 mpg city and 51 mpg highway which is about 20 more mpg than the regular Civic. It holds 12.3 gallons of gas (1 gallon less than the regular Civic), so at 51 mpg on the highway you can hopefully go 627.3 miles. The Hybrid emits 4.40 tons per year of greenhouse gases, so it does indeed pollute less than the other car. So again, let’s do some simple math…$22,600 for the car plus $595 for destination fee plus $1,864 in tax makes the Hybrid cost about $25,059 to drive home. At first glance, this looks like it adds a $3200 premium over the standard Hybrid, but let’s continue on. Let’s say you keep this car for 5 years as well and drive the same 15,000 miles per year at an average of 50 mpg, which amounts to 1,500 gallons of gas at today’s price of $3.00 – making your total for gas over 5 years $4,500. That’s a savings of about $2,000 in gasoline costs just over 5 years as compared to the car above. So add them all up again and you get $25,059 plus $4,500 in gas = $29,559 over 5 years. Then if you sold this car, if the average Honda retains 49% of its value, you could sell it for $11,074. $29,559 – $11,074 = $18,485 for use and gasoline in 5 years. About the exact same as the car above…but wait, there’s more! Honda Civic, standard gasoline engine: $18,231 including use and gasoline for five years. This breaks down to $3,646 per year or $303.83 per month. 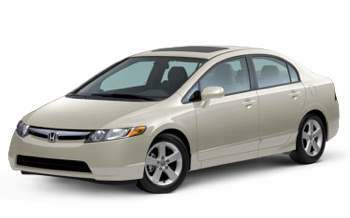 Honda Civic, hybrid gas/electric engine: $16,385 including use and gasoline for five years. This breaks down to $3,277 per year or $273.08 per month. In addition to the cash savings you also emit less pollution and depending on where you live, you might get to ride in the carpool lane by yourself or park at parking meters for free, so there are a few extra bonuses as well. It seems to me that while the cash difference between the two cars is not that significant, it is close enough that people considering the regular Civic should also consider the Hybrid. Sure, it might have a higher price tag in the window, but when you break down the costs over the first 5 years of ownership, the Hybrid comes out slightly ahead, both in expenses and “green-ness”. Either car is a fantastic car; I owned a Civic years ago that ran without complaint right up to 150,000 miles when I got rid of it, and my brother has owned a few now. Although I love the Prius, my wife and I are digging the “regular old car” look of the Civic Hybrid. Other than not knowing when, I know that our next car will definitely be a hybrid! I’ve been wanting to own a hybrid car for some time now. Too bad most of the incentives that the government used to give are going away!! The Prius incentives have gone but the Civic ones are good till the end of the year! I don’t know if you’ve looked up prices on used hybrids, but they definitely hold their value better than a standard gas car, and better than the 49% value you used. 1. You are buying a new car. If you want to buy a 3-4 year old Kia Rio (which is a car that loses a lot of it’s resale value), you can drive for far less than $3,000 a year. As long as I’m going to drive something on the low end, I figure I might as well go all out and save as much as possible. 2. You drive around 15,000 miles a year. I’ve averaged around 9,000 and I’m on the low side. However, I’ll drive less soon as my commute is going to 6 miles a day, round trip. 3. That you are looking for a new Honda Civic type car before the end the year. It seems that if you are not the tax break doesn’t apply. As you say at the end, “Other than not knowing when…” that seems to be a key factor. 4. You believe that the hybrid is more environmentally friendly. I’ve read some stuff to the contrary. I’m sure you are more informed than I am, but I’d still need to do the research to make sure that we aren’t filling up landfills with batteries, or that it requires more energy/materials to make a hybrid. 5. Take this older article about the hybrid Accord… “The best you can say from all that is that the hybrid uses less fuel, but “” typical of hybrids “” not enough less to financially justify the purchase. In fact, it would take you more than a decade to save enough on fuel to repay that $3,400 price premium vs. a gas Accord, assuming today’s gas prices, 12,000 miles a year and fuel economy as good as the ratings.” That may have changed, but you need to do the research on the specific car that you intend to buy first. In the end, that’s what it comes down to… doing the research and plugging in the numbers. They might Garrett, but since they are barely ever available used, its hard to get a “real” number..but they should be worth more, yes. LazyMan – It’s also about leaving behind less pollution…but the argument about money always assumes that gas prices stay about the same as they are now. I am willing to bet that gas goes up, and rightly so: we should be paying a lot more for it than we currently do. When it reaches $5 + per gallon, it will be about the right price that it should be. How much of the difference is fuel economy is due to the 30 horsepower difference? And, the tax break isn’t free money it comes out of our pockets. Ben, as for question #1, I am sure it has something to do with it, but it also has to do that the car can run on batteries while going slow and it turns off while sitting still. As for #2, it isn’t “free” in the true sense of the word, but it is a payback for buying the hybrid, so it is “free” money because you wouldn’t get that money back anyway…you already paid it in your taxes.